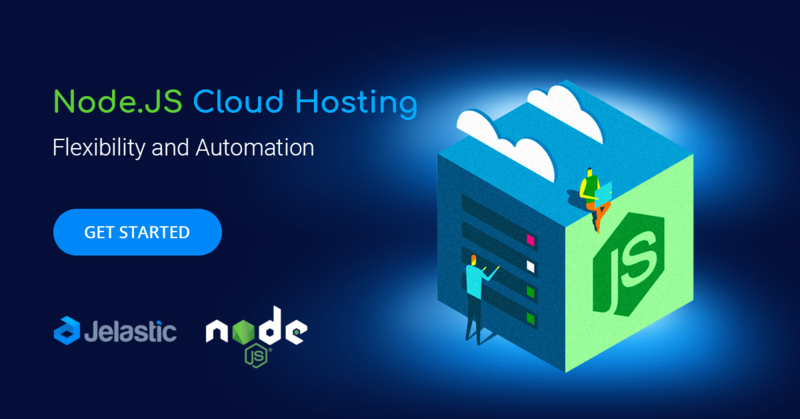 Jelastic PaaS provides an out-of-box integration of the fast, lightweight and highly scalable NodeJS application server. It is automatically supplied with numerous optimization and management tools to make the hosting process maximally convenient for developers. In this article, we’ll go through the main tools and features available on the platform to provide the required level of Node.js hosting. To run your Node.js application, you need to set up the appropriate environment using the powerful and intuitive Topology Wizard. 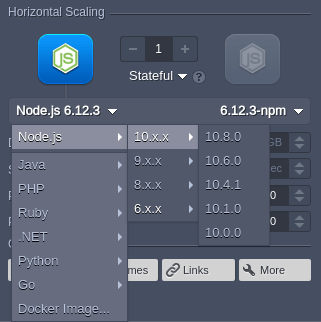 Switch to the Node.js tab, select the required engine version for your application server and add any other software stack required. If needed, adjust other parameters, such as cloudlets and nodes count, Public IPv4 and IPv6, etc. Note: Each instance is a completely isolated container, fully independent and uninfluenced by other stacks. Additionally, scaled out nodes are automatically distributed across the physical servers (or VMs) ensuring high availability. 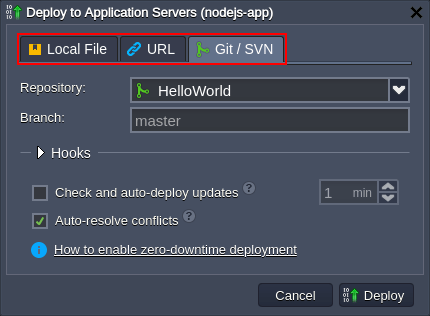 You can select the required version of Node.js directly from the topology wizard during the creation of a new environment and adjust it for the existing one via container redeployment. For greater convenience, each NodeJS application server contains a built-in development tool called Package Manager, which provide standardization and automation of the installation, update, configuration, and removal processes. By default, the npm package manager is used for the NodeJS application servers, but, if necessary, it can be easily switched to yarn. For that, access the container variables frame and set the appropriate PACKAGE_MANAGER value (either npm or yarn). Users can choose the necessary process manager during container redeployment or by adjusting the PROCESS_MANAGER variable (using forever, npm, pm2 or supervisor as value, container restart is needed to apply new options). Also, you can quickly switch traffic between your environments (e.g. to redirect customers to the newer application version without downtime) by utilizing the swap domains functionality or with the help of the SwapExtIps API/CLI method. 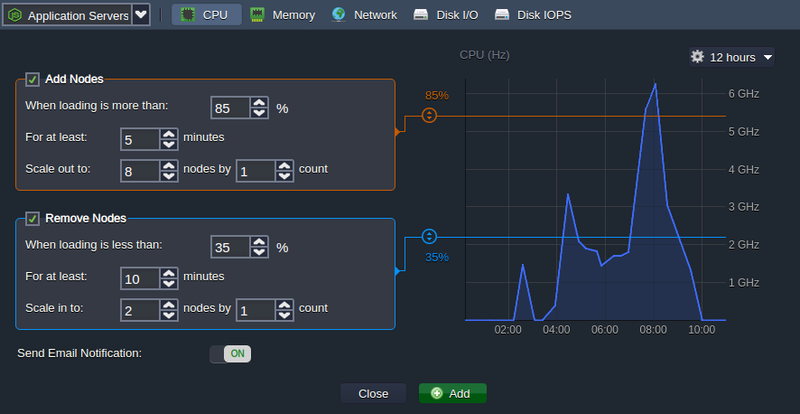 Jelastic PaaS dynamically provide the exact amount of resources (RAM and CPU) required by your nodes according to the current load with no manual intervention required. As a result, you never overpay for unused resources and save your time as the platform eliminates the need to handle the load-related adjustments or architectural changes. You just need to set the upper cloudlets limit (each one equals to 128 MiB of RAM and 400 MHz of CPU) for your NodeJS application server and everything else will be handled by platform automatically. Refer to the automatic vertical scaling documentation for more information. The maximum number of the same-type servers within a single environment layer depends on a particular hosting provider settings (usually this limit stands for 16 nodes and can be enlarged by sending the appropriate request to support). Also, for the proper requests distribution, a load balancer instance is automatically added upon NodeJS server scaling. Refer to the horizontal scaling documentation for more details. Access the environment Settings > Monitoring > Auto Horizontal Scaling section to set up special tunable triggers, which allow to increase or decrease the number of nodes due to the application load. Configure type of resource to be monitored (CPU, RAM, Network, Disk) and the exact condition of scaling. Learn more about automatic horizontal scaling in the linked document. 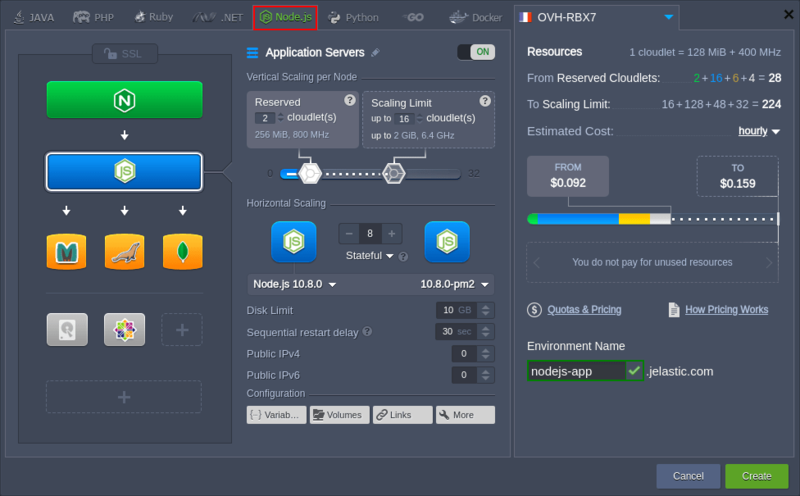 As you can see, Jelastic PaaS provides all the necessary conditions for smooth Node.js hosting! Get your trial account for free and try it right now!